In April, Argentina announced yet another new antidumping investigation on imports from Brazil – this time on fabrics. Notably, Brazil did not initiate any comparable investigation on Argentina or on fabrics. In July, Brazil announced a major new antidumping investigation on imports from China – this time on steel products. Notably, Argentina did not. These are merely two examples from a longstanding Argentine and Brazilian tradition. From the beginnings of the MERCOSUR trade agreement of the 1990s, these countries have continuously failed to coordinate changes in important trade policies applied toward non-members.1 And by applying antidumping against one another, for numerous products they also frequently do not engage in bilateral free trade. What are the implications? Specifically, to what extent does consideration of import-protecting policies beyond applied tariffs – but also antidumping, countervailing duties, and safeguards – affect our understanding of how changes in bilateral policy affects a country’s trade policy facing the rest of the world? Latin American preferential liberalisation: Building blocks or stumbling blocks? Many major economies in Latin America undertook substantial trade liberalisation in the 1990s. The seminal research of Estevadeordal et al. (2008) was the first to provide empirical evidence of the ‘building blocks’ phenomenon associated with preferential trade agreements. Their study of ten Latin American countries over 1990-2001 documented clear and compelling evidence that countries that implemented free trade agreements (FTAs) subsequently went on to lower their multilateral tariffs facing the rest of the world. While long a theoretical possibility, this research was important because the only prior work linking changes of multilateral and preferential tariffs had found evidence going in the other direction. ‘Stumbling blocks’ findings had arisen from studies of high-income economies of Limão (2006) for the US and Karacaovali and Limão (2008) for the EU. In products where the US or EU had previously offered preferential tariffs under special discriminatory arrangements, these two economies were less likely to subsequently offer meaningful non-discriminatory – or most-favoured-nation (MFN) – tariff cuts to the rest of the WTO membership during the Uruguay Round of negotiations. However, despite Argentine and Brazilian bilaterally applied tariffs falling and remaining low, the average MFN tariff that each country applied toward imports from the rest of the world has been mostly unchanged since the mid-1990s. To clarify, Figure 1 only reflects information on these two countries’ applied tariff rates. It does not include any data on additional trade restrictions such as the temporary trade barrier (TTB) policies of antidumping, safeguards, and countervailing duties. In practice, Argentina and Brazil frequently impose TTBs as specific duties, price undertakings, and even quantitative restrictions. Figure 2 illustrates the increasingly important empirical relevance of these policies with data from the World Bank’s Temporary Trade Barriers Database (Bown 2015). 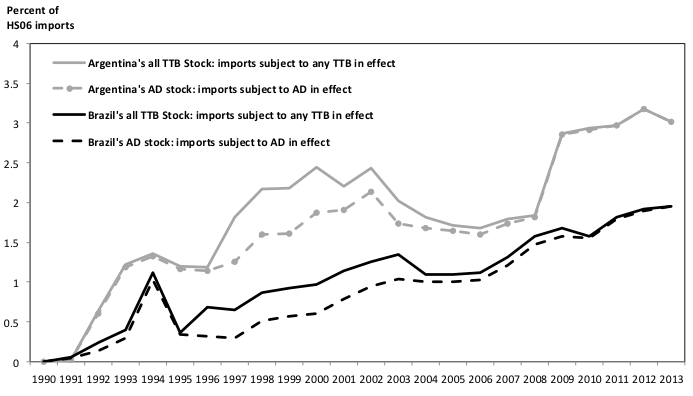 It plots the share of imported products that Argentina and Brazil covered with their imposed TTBs over 1990-2013. There is a clear upward trend for the import coverage ratio associated with each country’s applied TTBs. However, there are both level differences and inter-temporal differences as to when each country added significant new TTBs.3 These are the first evidence of an uncoordinated application of the TTB policies by the two countries. Argentina and Brazil apply TTBs against imported products from different non-MERCOSUR countries in different sectors at different moments in time. In recent research, we use the TTB data to re-examine the relationship between changes in Argentine and Brazilian bilateral trade policy over 1990-2001 – during the formation of MERCOSUR – and each country’s subsequent applied policy changes toward the rest of the world (Bown and Tovar 2016). Our main contribution is to provide a more expansive definition of changes in levels of import protection going beyond applied bilateral and MFN tariffs. This is motivated by evidence from other settings – e.g., India’s experience of the 1990s (Bown and Tovar, 2011) – that some countries substitute one form of import protection for another during a tariff liberalisation episode. Under the period in which MERCOSUR was a customs union (1995-2001), inclusion of TTBs indicates that MERCOSUR was a stumbling block for subsequent multilateral liberalisation. Latin American countries have experienced divergent liberalisation episodes since the mid-1990s. Some Latin American economies continued to reduce their tariffs toward trading partners outside of the region even after the 1990s. As of 2013, according to the WTO (2014), average applied MFN tariffs had fallen to low levels in Chile (6%), Colombia (9%), Peru (3%), and Mexico (8%). And yet Argentina and Brazil have not. Argentina and Brazil continued to apply MFN tariffs that averaged 13% in 2013, only slightly lower than the levels each applied in 1995. The details of the MERCOSUR institutions established in the 1990s are important. In this case, it mattered that there was no discipline on use of antidumping against each other and toward third countries. Under the customs union element of MERCOSUR, Argentina and Brazil apply the same general tariff on imports from third countries not party to the agreement. Yet, the experience since 1990 has been dozens of examples like the one of Brazil (but not Argentina) using antidumping to restrict steel imports from China. The lack of coordination in their applied trade policy toward third countries questions the extent to which they are really involved in a meaningful customs union. Under the FTA element of MERCOSUR, Argentina and Brazil apply a general tariff of zero on imports from each other. Yet, experience since 1990 has been dozens of examples like the one of Argentina imposing a separate, antidumping import restriction on imports from Brazil of fabrics. This lack of bilateral discipline questions the extent to which these two countries are even involved in an economically meaningful free trade agreement. The fact that Argentina and Brazil do not coordinate their most actively changing trade policies of antidumping and safeguards has other important implications. Each can and does continue to respond to political-economic shocks independently. Yet, this also makes them unable to take full advantage of the benefits of a customs union arrangement. In particular, the inability to credibly coordinate joint policy changes means they have been unable to amass increased bargaining power vis-à-vis the rest of the world – that might have otherwise arisen through increases in their (joint) import market power – to better negotiate collectively. Bown, Chad P. and Meredith A. Crowley (2014) “Emerging Economies, Trade Policy, and Macroeconomic Shocks,” Journal of Development Economies 111: 261-273. Bown, Chad P. and Patricia Tovar (2011) “Trade Liberalization, Antidumping, and Safeguards: Evidence from India's Tariff Reform,” Journal of Development Economics 96(1): 115-125. Bown, Chad P. and Patricia Tovar (2016) “Preferential Liberalization, Antidumping, and Safeguards: Stumbling Block Evidence from MERCOSUR,” Economics & Politics, forthcoming. Available as CEPR Discussion Paper No. 11494, September. Bown, Chad P. (2015) Temporary Trade Barriers Database. The World Bank, available at http://econ.worldbank.org/ttbd/, June. Conconi, Paola and Harm Schepel (forthcoming) “Argentina — Import Measures: How a Porsche is worth Peanuts,” World Trade Review. Estevadeordal, Antoni, Caroline Freund and Emanuel Ornelas (2008) “Does Regionalism Affect Trade Liberalization toward Nonmembers?” Quarterly Journal of Economics 123(4): 1532-1575. Karacaovali, Baybars and Nuno Limão (2008) “The Clash of Liberalizations: Preferential vs. Multilateral Trade Liberalization in the European Union,” Journal of International Economics 74(2): 299-327. Limão, Nuno (2006) “Preferential Trade Agreements as Stumbling Blocks for Multilateral Trade Liberalization: Evidence for the U.S.,” American Economic Review 96(3): 896-914. OAS (2016) “SICE Foreign Trade Information System: Trade Agreements in Force,” Organization of American States, available at http://www.sice.oas.org/agreements_e.asp, last accessed 7 September. WTO (2014) World Tariff Profiles 2014. Geneva: World Trade Organization, International Trade Centre, and UNCTAD. Another example is that Brazil negotiated a bilateral free trade agreement with Mexico that went into force in 2003, whereas Argentina’s bilateral free trade agreement with Mexico did not go into force until 2007 (OAS, 2016). Furthermore, Conconi and Schepel (forthcoming) describe an Argentine trade policy imposed in 2009 – that led to a formal WTO trade dispute brought by the EU, Japan, and the US – that required that foreign firms offset the value of their firm-specific exports to Argentina with an equivalent value of imports from Argentina. In order to offset their exports to Argentina, specific examples of foreign auto firms’ offsets included that Nissan exported Argentine soy products, Mitsubishi exported Argentine peanuts, Hyundai exported Argentine wine, and Subaru exported Argentine chicken feed. There is no record of Brazil implementing a similar policy. In addition to Brazil (159.4 million in population in 1994), and Argentina (34.4 million), the MERCOSUR agreement at the time also included Paraguay (4.7 million) and Uruguay (3.2 million). 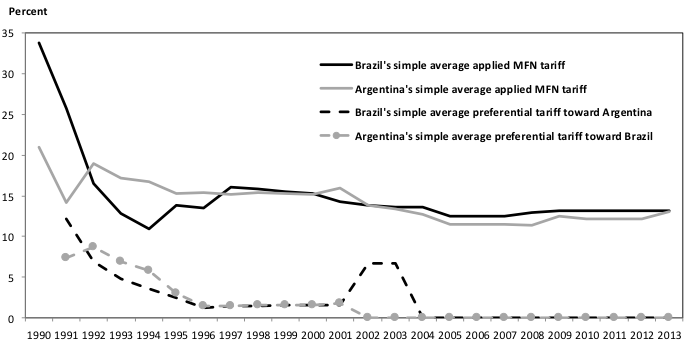 In a cross-country framework involving Argentina, Brazil and eleven other emerging economies over 1989-2010, Bown and Crowley (2014) associate annual increases in applied TTBs to macroeconomic shocks such as real appreciations of the local currency, declines in local real GDP growth, and increases in the local unemployment rate.